Supports Pandora, Livio, iHeartRadio, SiriusXM Apps! Designed for newer Toyota/Lexus vehicles with Navigation. Full on-screen display and control from navigation radio screen. Scroll through and select playlist, artist, or songs directly on your navigation radio. Works with all new navigation radios with MP3 capability! Works with and charges iPhone (3G, 3Gs, 4, 4s), iPod Classic, Nano, and Touch. Displays song title, artist name, and playlist information on most radios that have a Text, or Title button. Retains CD changer, Rear Seat Entertainment/DVD, and Satellite radio functions and features. You can connect an addition audio device such as DVD player, Satellite radio receiver, or MP3 player to the Aux input on the interface. 2 different modes to control and play iPod: Direct Mode and Playlist Mode. Playlist Mode: operate and control the iPod like it is a CD changer. Access up to 6 Playlists from the radio. Direct Mode: search and select music on iPod just as you would in portable use. This mode can be selected right from your radio. Complete access to all the contents on iPhone and iTouch. 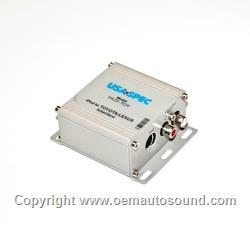 Works on vehicles with and without SAT Tuner button as well as vehicles with or without SAT Tuner activated. 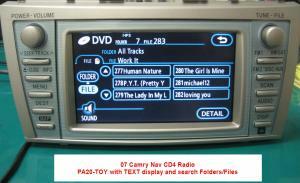 The PA20-TOY adds additional on screen display and control functions on newer Toyota/Lexus Radios. Newer NAV radios can be identified as those that have MP3 capability or those that display the MP3 logo on the radio face. Comes with all cables and connectors for most applications. Use your iPod to create up to 5 favorite mobile playlists. Then, access, play, and control each favorite playlist with your factory radios or on all Toyota/Lexus radios. Comes with new 5v Charging cable !! Charges all new and older iPods iPhone's. PA20-TOY comes standard with new iPod cable that fully charges all iPods, including the new 4g,3G iPhone, new NANO and new 2nd Gen iTouch. Users do not lose and Cd, In Dash Cd Changer, XM or Sat features or functions of their existing radio system.